Includes the personal pages 'MyProjects', 'MyPreferences', 'MyResults' and 'MyReviews'. Leads to 'Explore', 'Search' and 'History'. Leads to 'Showroom' where you can discover all kind of charts, visualize the tree used for coding, explore events in space & time - projected on a globe or in euclidian space or expore naural events curated by Nasa out of imagery in near real time. Check out results of other users or write something about the reults of your own project for other users or the public. To create a new project follow MyDesktop > MyProjects. 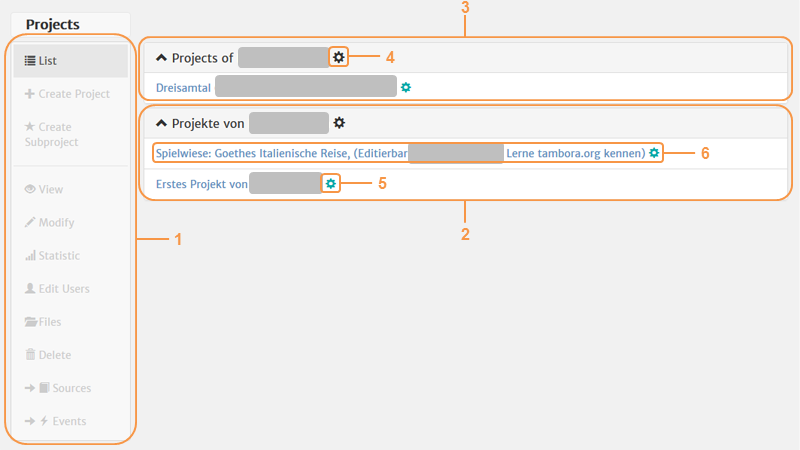 Click on the symbol next to "Projects of your Name"
Here you can find general information about your projects. To add a new project press Create Subproject. 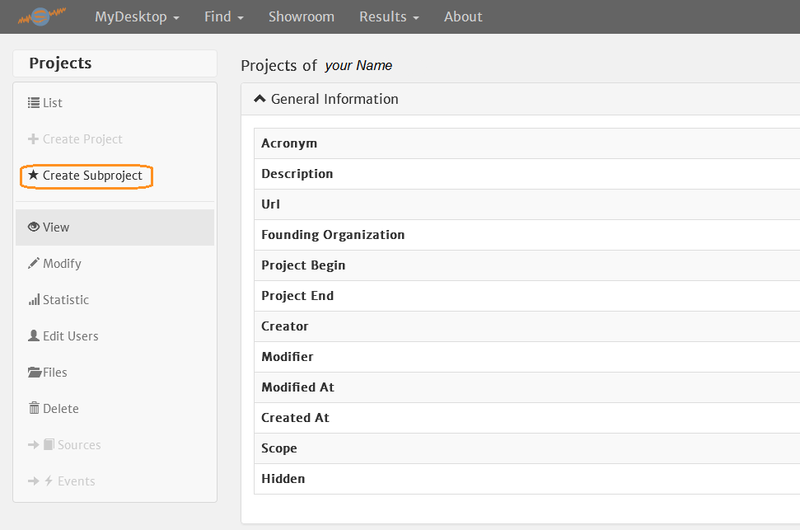 Add required information about your project and press Create at the bottom of the page. Now you can find your new project here: MyDesktop > MyProjects. An empty project looks like this. To start working you first have to add a new source. 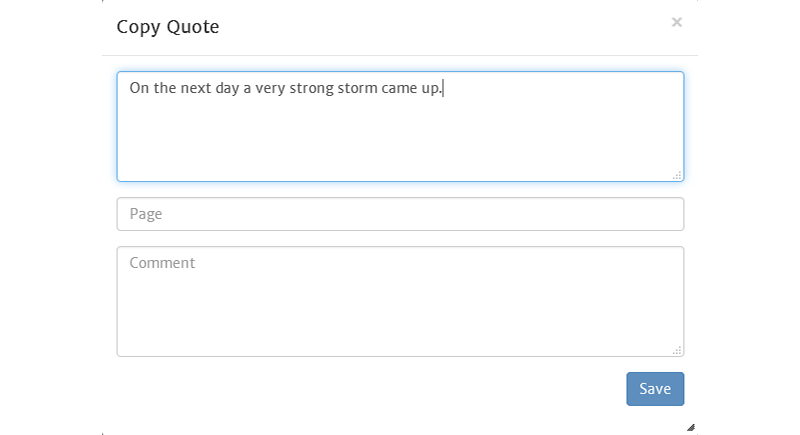 You can edit a quote by clicking on the pencil next to the quote. 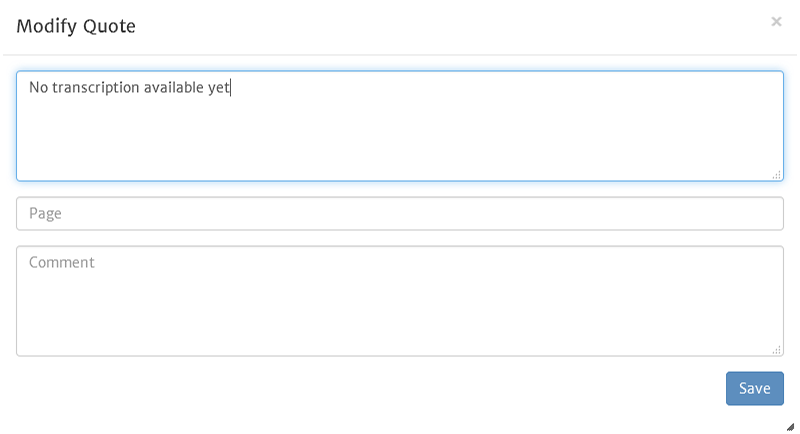 Type in the quote text you want to use and press Save. Reload the page. 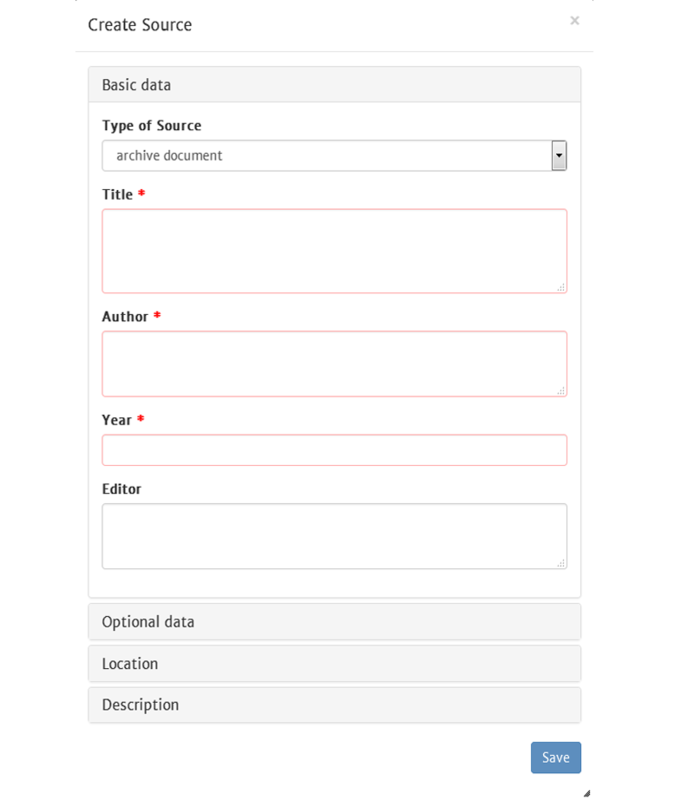 Now you can see the updated quote in your project. 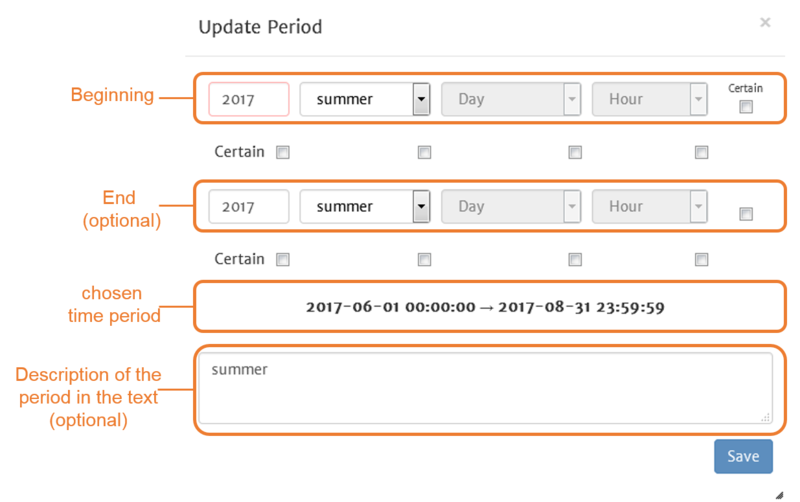 To modify the period click on the pencil icon next to the current date or 'missing date'. Choose period and add the description from the quote. Press Save. To modify the position click on the pencil icon next to existing location or 'missing position'. Choose position and add the description from the quote. Press Save location. 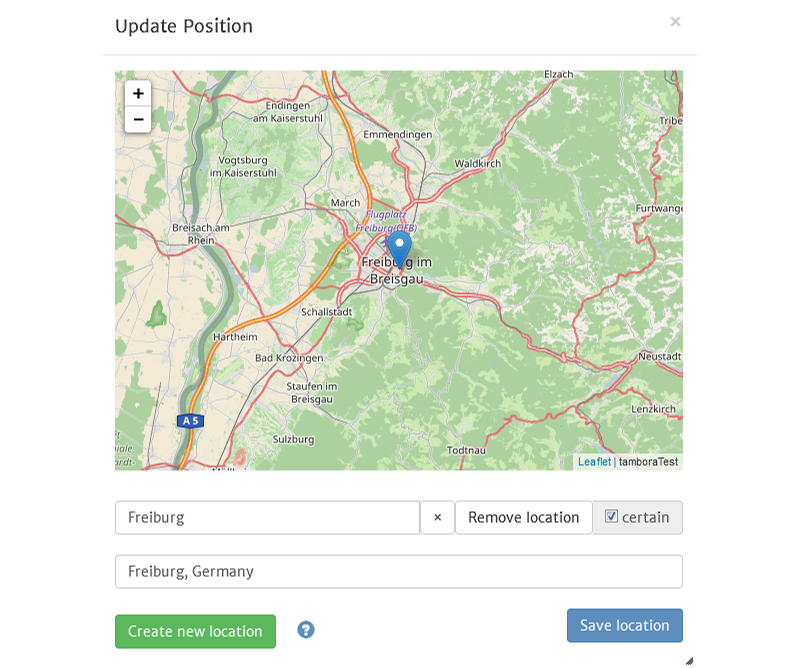 If the position doesn't exist yet you can create a new location. To modify the coding click on the pencil icon next to existing content or 'missing code'. Choose suitable coding from the coding tree and add the description from the quote. Press Save. Reload the website. The coded event is now highlighted with colors. To add a further event in the same quote click on the copy icon . 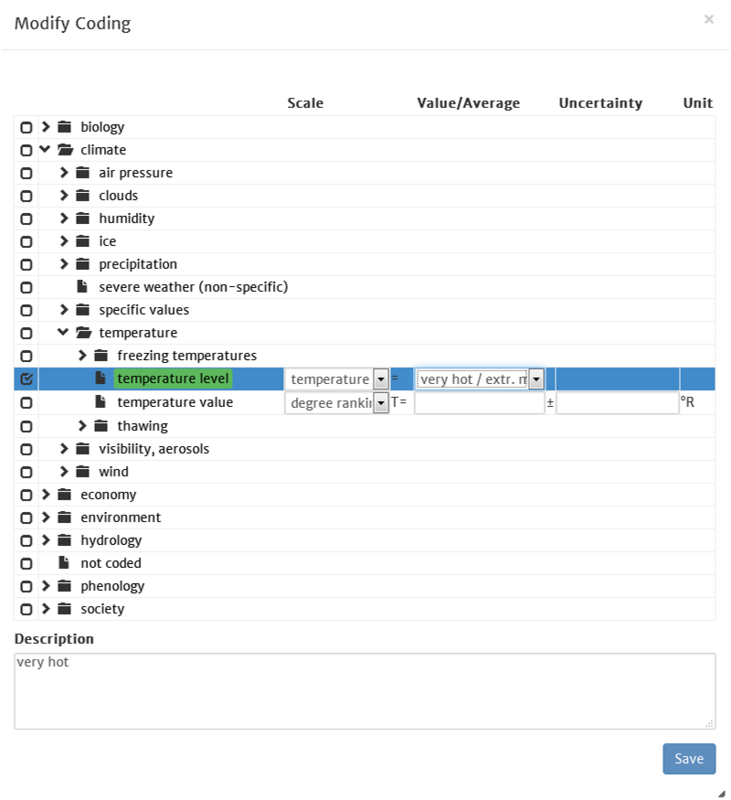 Modify the period, position and coding where needed as described in the previous section. Then reload the website again. Each event highlights it's own coded text pieces in bright colors while the coding in other events is marked in light colors. To add another quote from the same source click on the copy icon next to the quote. Edit the quote and press Save. Now you can code the event as described before. 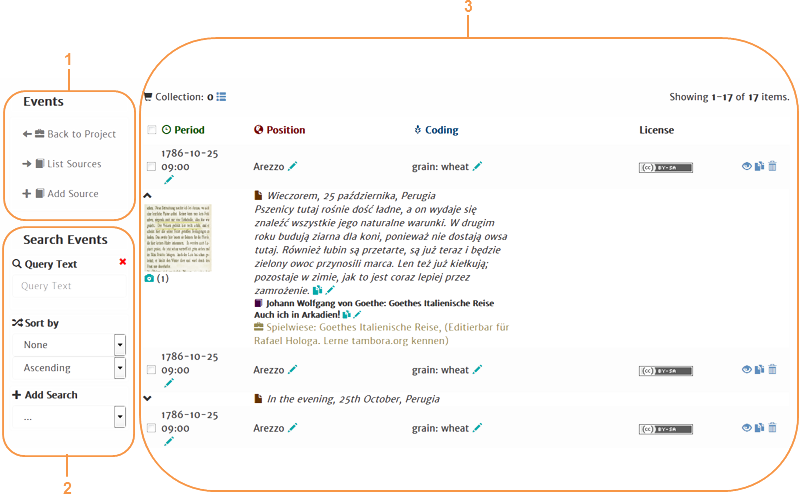 Here you can navigate to project description, list the sources related to the listed events or add new sources to expand your source material. Here your have an overview of events according to your navigated project.